"A good clavichord, well played, is sweeter and more heart-stirring than any other instrument... It is indispensable for study." 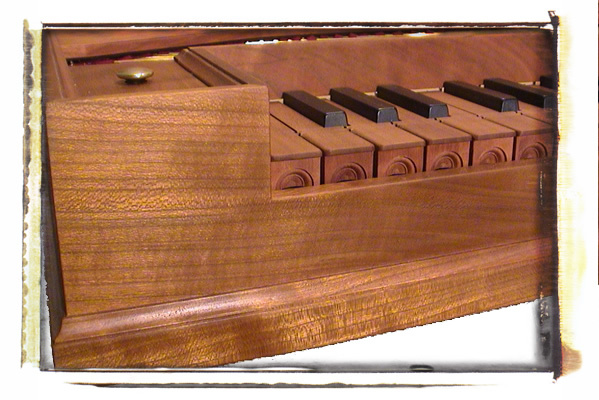 The clavichord is perhaps the most personal and expressive of all keyboard instruments. It's unique construction permits the player to remain in contact with the strings even after the initial attack. This gives the player precise control of the dynamics and the continuing character of the sound. Many keyboard performers are turning to the clavichord for the lessons it affords them in developing evenness, sensitivity and clarity of touch. The clavichord demands from the player a certain level of precision in execution if one wishes to exploit its' possibilities to the fullest. 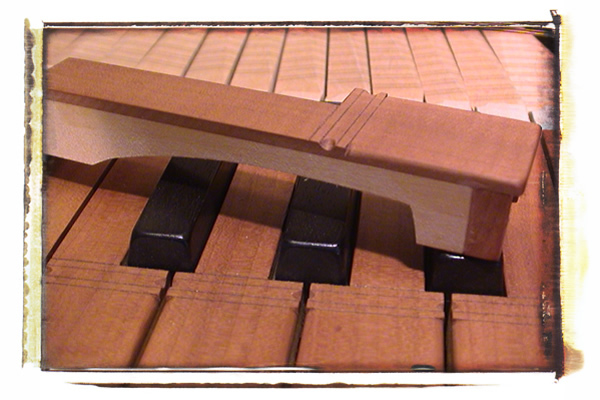 The Clavichord provides the amateur player with an easily maintained, easily housed and musically rewarding instrument. For the advanced player it opens new worlds of musical and technical insight. Clavichords such as these were the typical domestic instrument in Germany, Austria, Italy, the Scandinavian countries and on the Iberian peninsula for over four hundred years. Throughout this time, the majority of clavichords were of the fretted type. In the fretted, or gebunden clavichord, most strings (or pairs of strings as in our double-strung instruments) are shared by two keys, so that C and C#, for instance, are both played on the same string or pair of strings. 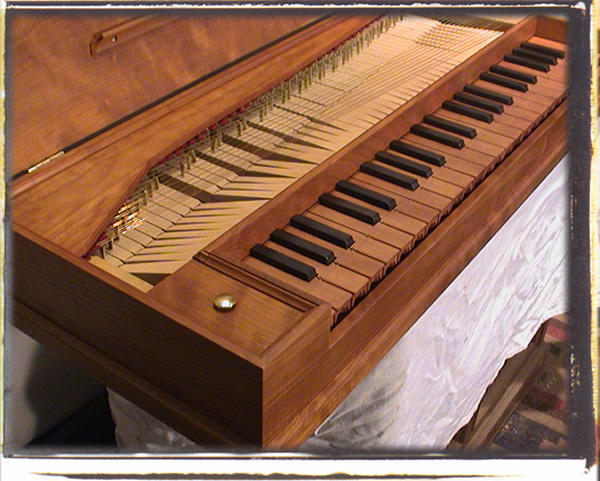 My Small Fretted clavichord is a fine example of a late 17th century fretted clavichord. 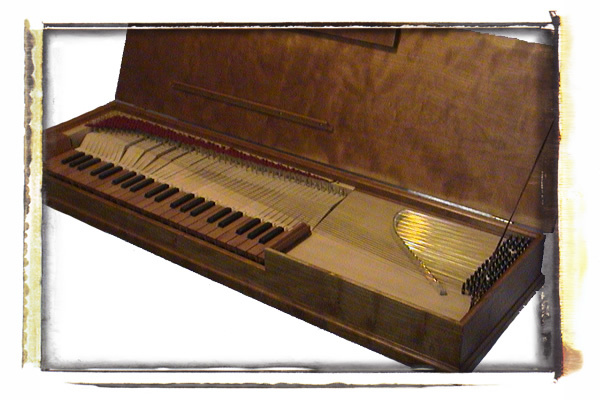 I will gladly build one for you or build it yourself with my exceptional clavichord kit. 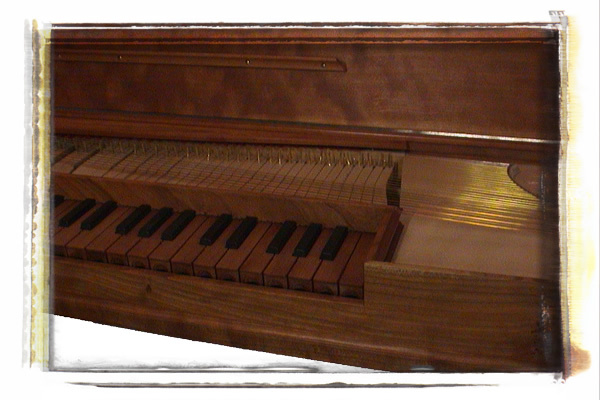 My Hubert clavichord is an excellent example of a larger fretted clavichord. Based on an instrument by Christian Gottleb Hubert, Ansbach 1782. With a keyboard range of C – g3, 56 notes, this is a versatile instrument that both plays and sounds wonderful. 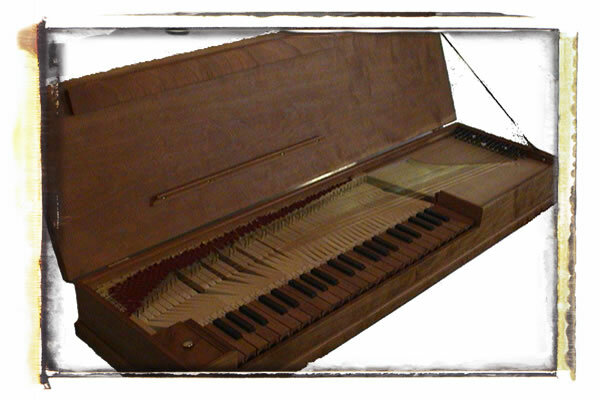 This clavichord is available as a custom built instrument or as a clavichord kit. 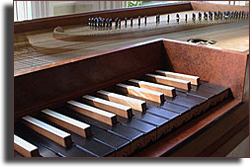 The later bundfree, or unfretted clavichord employs one pair of strings per note. 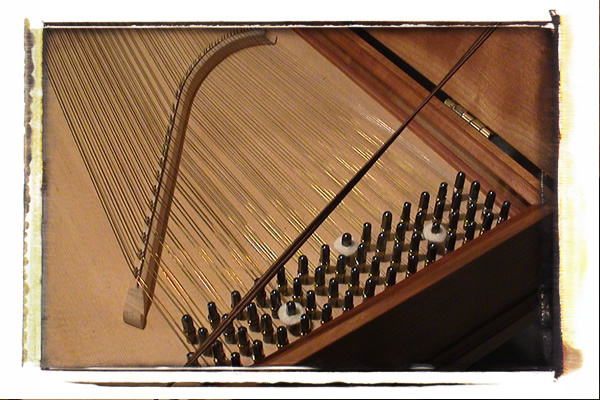 As a result of this arrangement, the number of strings needed in a fretted clavichord could be nearly half those needed compared to the unfretted instrument. 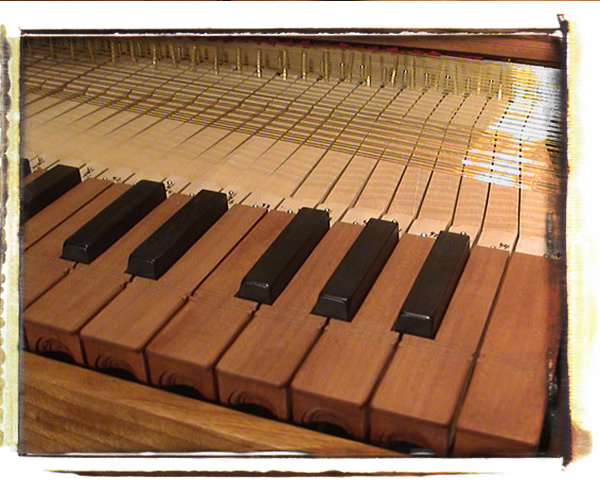 Some people feel the fewer strings found on the fretted clavichord result in a decreased load on the soundboard and subsequently a fine, more resonant and singing tone. The Schiedmäyer clavichord is a fine representative of the large later clavichords which are so admirably suited to the music of Hayden, Mozart, C.P.E. Bach and their contemporaries. These clavichords are in sound and appearance quite elegant. There is a unique ambiance and romantic richness of sound which surrounds the player and listener with a shimmering aura and clarity of voice. The larger unfretted clavichords are wonderfully suited for the music of the late baroque, classic and romantic composers. The versatility and range of these instruments make them an indispensable part of my keyboard collection. My clavichords are built to the highest standards of workmanship and design. Their quality is the result of many years experience in building early keyboard instruments. My research into the art, craft, and history of keyboard instrument building is a vital and continuing part of my work Every instrument that leaves is of the highest quality in sound, and construction, and as durable and trouble free as possible.